Barry M Nail Paint in Moonlight is so bright and bold I just had to turn up the drama and try it over OPI Push and Shove from the 2013 Gwen Stefani collection. 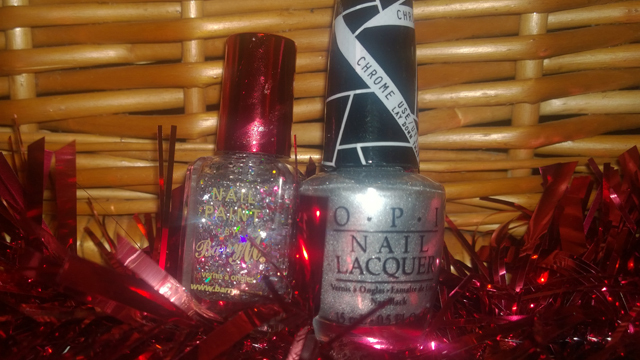 Moonlight is a silver glitter topcoat made up of silver stars, tiny silver circles of different sizes, silver rectangle pieces like tinsel, medium sized silver hexagonal pieces and the odd piece of randomly shaped red glitter which resembles torn papers. (See it over red here). OPI Push and Shove is a silver chrome shade so you can tell I was really going for the “look at me” effect. I naughtily did not use the designated base coat which came with it – Lay Down That Base so it painted on a little lumpy. You can’t tell however as so much is going on with Moonlight – something I love about glitter. 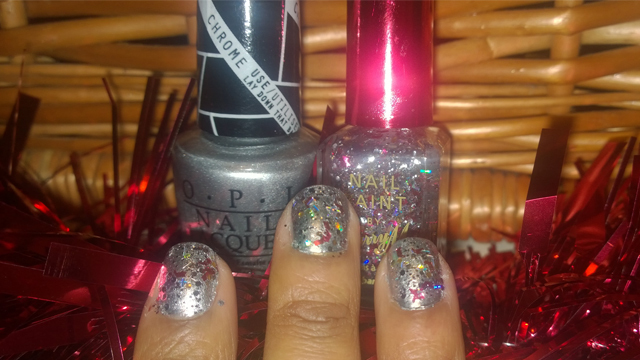 Glitter polishes hide a multitude of nail issues! It’s so difficult to capture the effect of glitter over chrome in a photo. The smaller silver pieces of glitter add texture, the stars and the hexagons are holographic so they give flashes of rainbow in certain light and the red pieces of glitter randomly scattered on my nails add that little bit extra to make my nails look even more special. The chrome base colour makes the whole look quite spectacular. All of this is achieved with only two bottles of polish and minimal effort. Who would have thought that it would be so easy to get such dramatic nails? 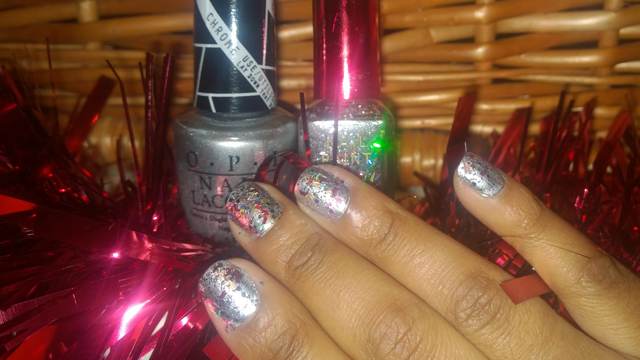 If you cannot get hold of Push and Shove anymore, you might be able to get the same effect using the Barry M Nail Effects Foils in Silver 319. I haven’t yet tried the Barry M foils but if you have I would love to see it!